Our large three pound pack of Faraon mayacoba beans offer quality and value. Mayacoba beans are very popular throughout the world and are called many different names, all leading to this one creamy looking, yellowish bean marvel: "Canarios", "Peruanos", "Mayacobas", "Bayos". 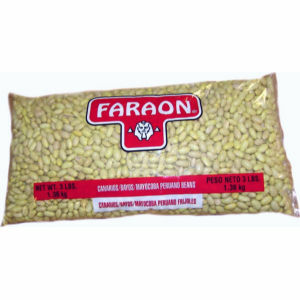 Faraon takes good beans and makes them better by packing the freshest available and using highly sophisticated selection and polishing techniques assuring you of a top quality product. That's why we say "Que Ricos Son!"